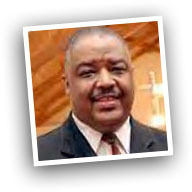 Bailey Group - Arthur L. Mackey, Jr.
Arthur L. Mackey, Jr., is the pastor of the historic Mount Sinai Baptist Church Cathedral in Roosevelt, New York. He is also president of Vision of Victory Ministries and Arthur Mackey Ministries. He is a graduate of Virginia Union University in Richmond, Virginia, where he majored in religion and philosophy. He is also a community research assistant in the Office of Communications and Public Affairs for the Town of Hempstead, America's largest township. Pastor Mackey is the noted author of the Biblical Principles of Success, Walking Through the Doorways of Destiny, Inner Healing for Men, Inner Healing for Women, Real Revival, Revival In The Valley of Dry Bones. Pastor Mackey has ministered throughout America, Europe, and Africa. Rev. Arthur L. Mackey, Jr. an author, founder and President of Mackey Productions, a Christian based, social outreach organization with an urban focus. The company was founded on the campus of Virginia Union University with an African American Art Series. Rev. Mackey is a graduate of Virginia Union University in Richmond, Virginia, where he majored in religion and philosophy. He also serves as pastor and youth director of Mt. Sinai Baptist Church in Roosevelt, New York. In addition, he is a community research assistant in the Hempstead Town Department of Public Information and an elected trustee of the Roosevelt Public Library District of Nassau County, New York. He is married to the lovely Brenda J. Mackey, and they have three children. EXPERIENCE: Have spoken throughout the United States, Europe, and Africa. Have spoken on platforms with Rev. Dr. Martin Luther King, Sr., Pastor Donnie McClurkin, Rev. Jesse Jackson, Elder Bernice King, Rev. Dr. Calvin Butts. Pastors the historic Mount Sinai Baptist Church Cathedral in Roosevelt, New York. Has bee interviewed by local and national radio and television media such as Bob Law's NighTalk of WWRL, New York Newsday, TBN of Fishkill, New York, and Charisma Magazine.